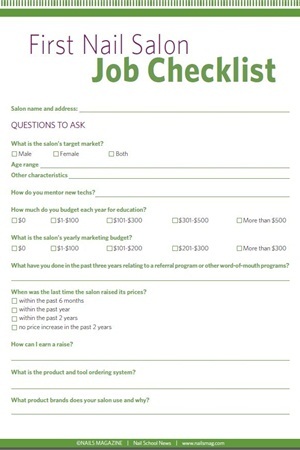 Help your students find the perfect first job to help them grow their nail business with this handout of questions to ask during the interview and things to observe at the prospective place of employment. Examples of questions include: What product brands does your salon use and why? and What tradeshows do or your staff go to? Things to observe during the interview include overall cleanliness, tech interactions with clients, and the dress code.